It is always a pleasure when we get to work with fantastic clients. 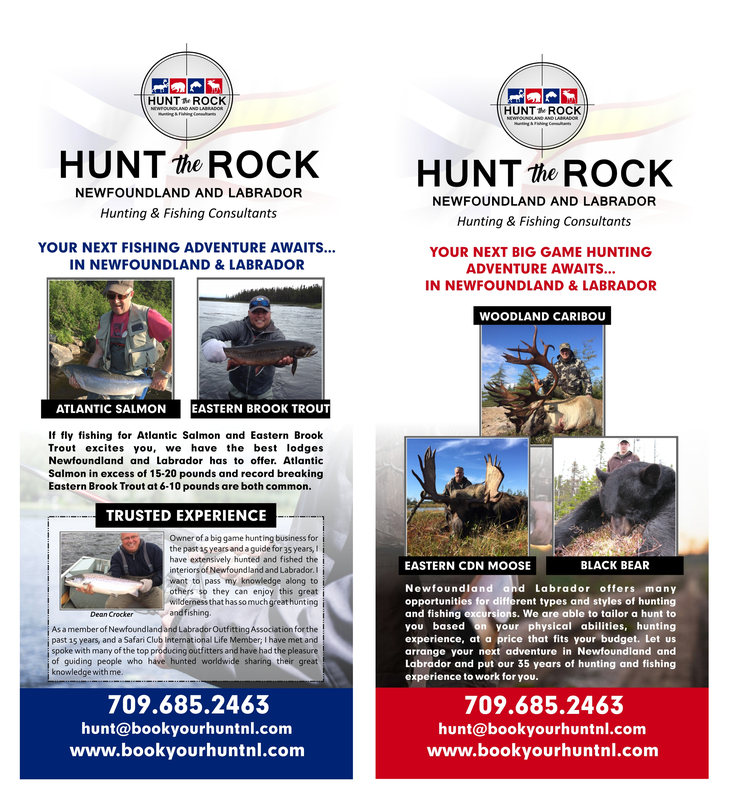 After we recently worked with Dean from Deep Country Lodge, we shared a conversation where he explained an idea to expand the business to offer Hunting & Fishing Bookings for Outfitters in Newfoundland & Labrador – and he wanted Silverhawk Promotions to be involved in the process. When two creative minds come together great things happen! 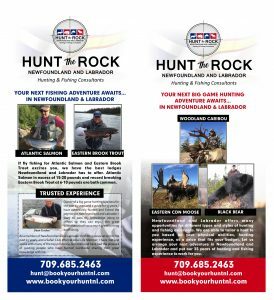 We are pleased to say Dean had us involved from the infancy stages in naming the business through to logo design, marketing design and web development – We had our fingers into every aspect of marketing for Hunt the Rock and we couldn’t be prouder of the end results. We were proud to see it take off, and look forward to the continued working relationship! 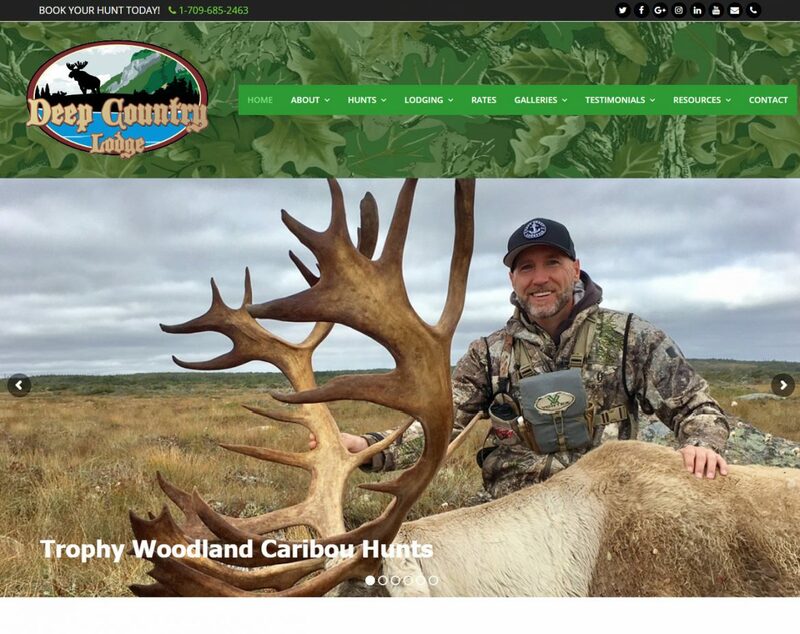 Recently Silverhawk Promotions was speaking with Dean from Deep Country Lodge; a client of ours for the past number of years regarding his existing website that we had produced for him. At that time – 3 years ago, it perfectly fit the business needs, but as time passed, the exiting design wasn’t working anymore. After some editing frustrations, he reached out to see if we could get things aligned the way he was hoping. We suggested that perhaps the old layout needed to be updated with the current ‘full width’ style of website now, and he was on board immediately. 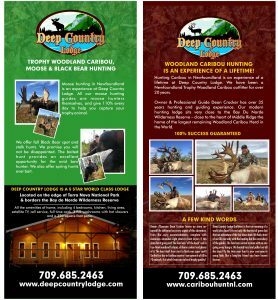 Silverhawk Promotions ended up totally re-vamping the Deep Country Lodge website, created a sister website to highlight a specific aspect of the business, and even designed a rack card! As always, it was a pleasure to deal with Dean from Deep Country Lodge, and we look forward to working again in the not to distant future! In addition to new Rack Cards, Aspen by the Sea Cottages approached Silverhawk Promotions to give their existing website a fresh new look – and we did not disappoint. 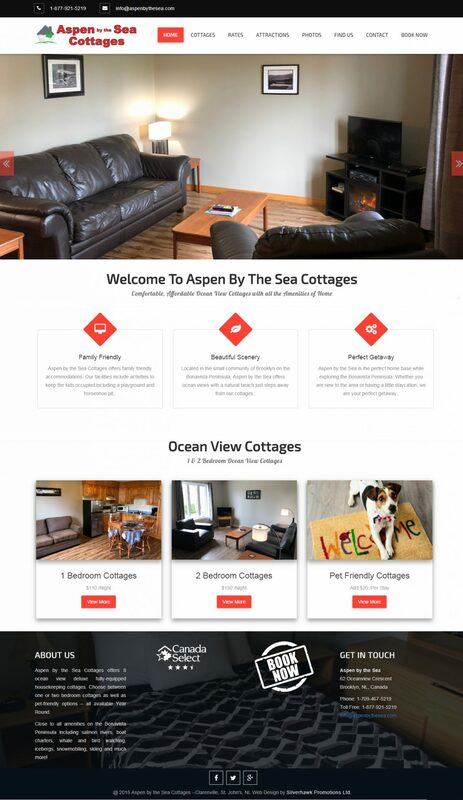 Offering a visually appealing website that is user-friendly, easy to navigate and mobile responsive – Aspen by the Sea Cottages now have a new website that will be functionable for the years to come. 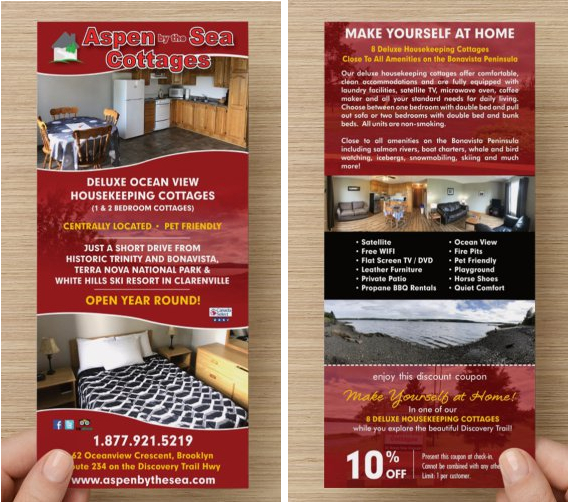 We were happy to assist Aspen by the Sea Cottages in the re-design of some of their marketing material recently – which included their rack cards. Aspen by the Sea Cottages is a year round operation offering 1 and 2 bedroom fully-equipped cottages at affordable rates. 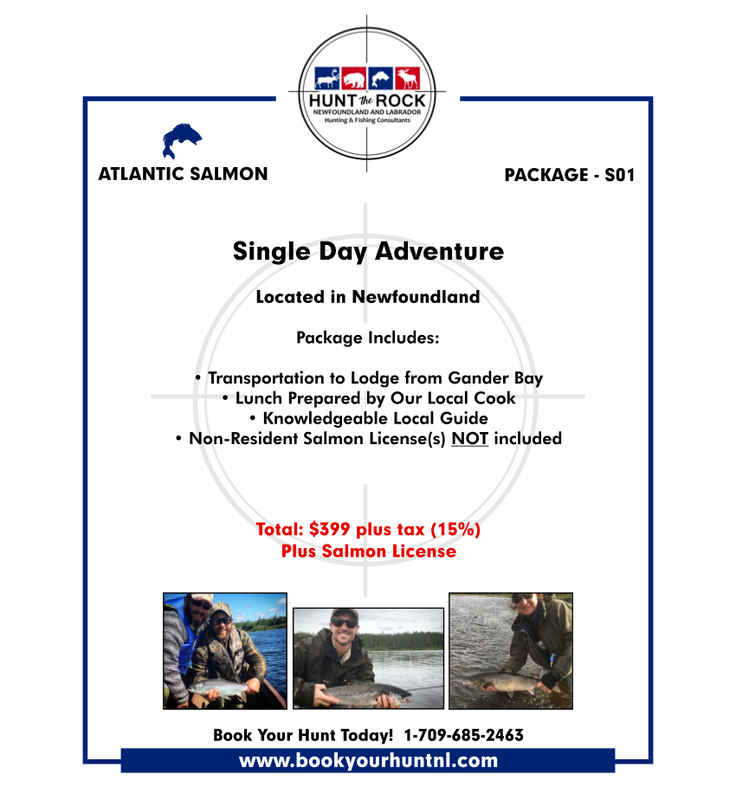 Located in Brooklyn on the Bonavista Peninsula – Aspen by the Sea Cottages now has updated Rack Cards that are both visually appealing, functional and offer visitors at 10% discount on their stay! 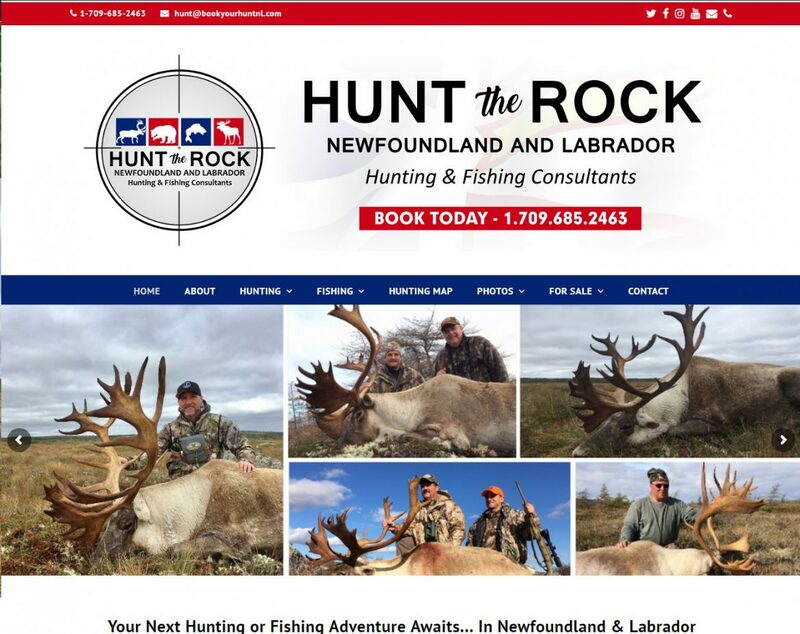 The Bargain Site – a Newfoundland Based discount merchandise website needed a logo. Of course Silverhawk Promotions was happy to assist. Simple yet eye catching and able to quickly tell the customer that the website is Canadian based. 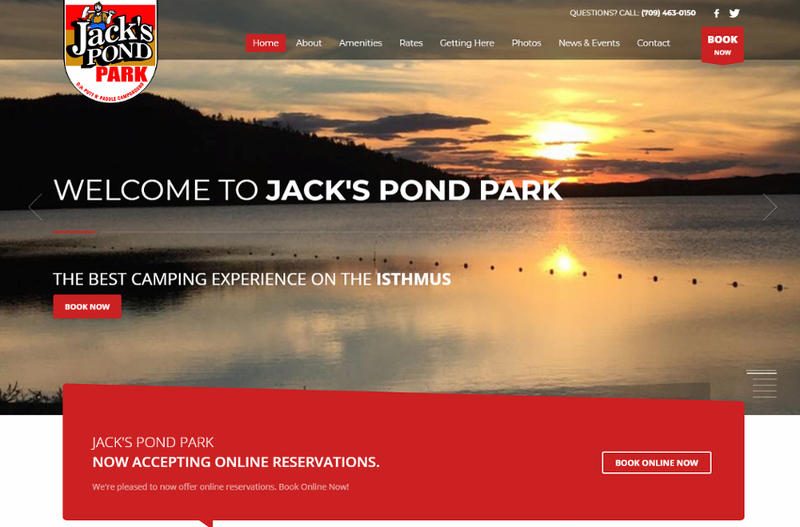 Jack’s Pond Park has been a client of ours for a number of years, and at the beginning of 2018, they decided it was time for a fresh new look to the website. We were excited to update their old static HTML based site to a fresh, new WordPress based system. With help from their community of campers providing some fantastic photography, Silverhawk Promotions was able to give the website a new lease on life. The site has gotten fantastic feedback, and since then Silverhawk Promotions has built a Facebook network including both a business page as well as a campers community group. 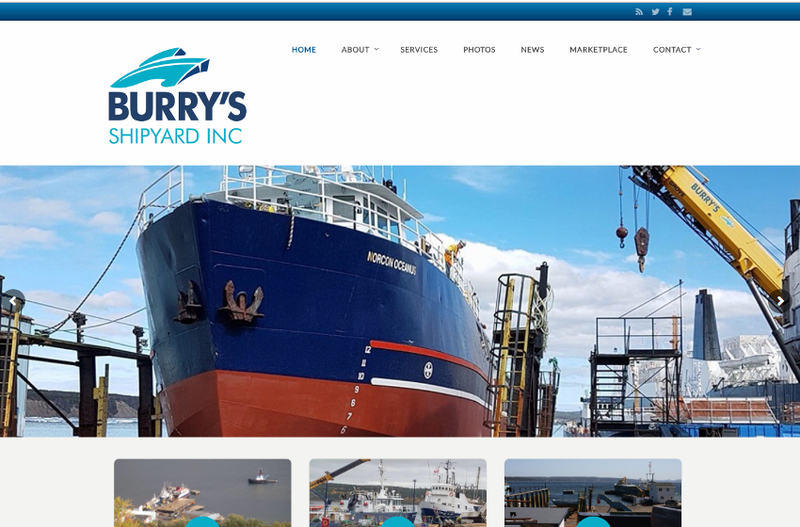 Recently completed the 4th web site in The Burry Group of Companies network – website for Burry’s Shipyard. Burry’s Shipyard Inc. (BSI) is a privately owned Shipyard, located in Clarenville, Newfoundland, Concentrating on Machining, Fabrication, Maintenance, Ship Repairs & Refits with a complement of trades and shops in the Ship Repair Industry. 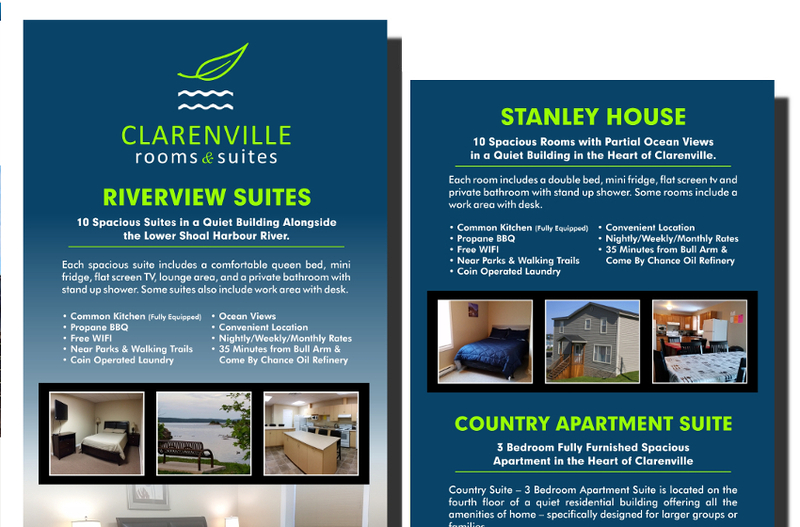 Clarenville Rooms & Suites recently expanded to include a 3 bedroom apartment suite and needed a rack card designed to showcase all three of their properties: Riverview Suites, Stanley House and most recently Country Apartment Suite. 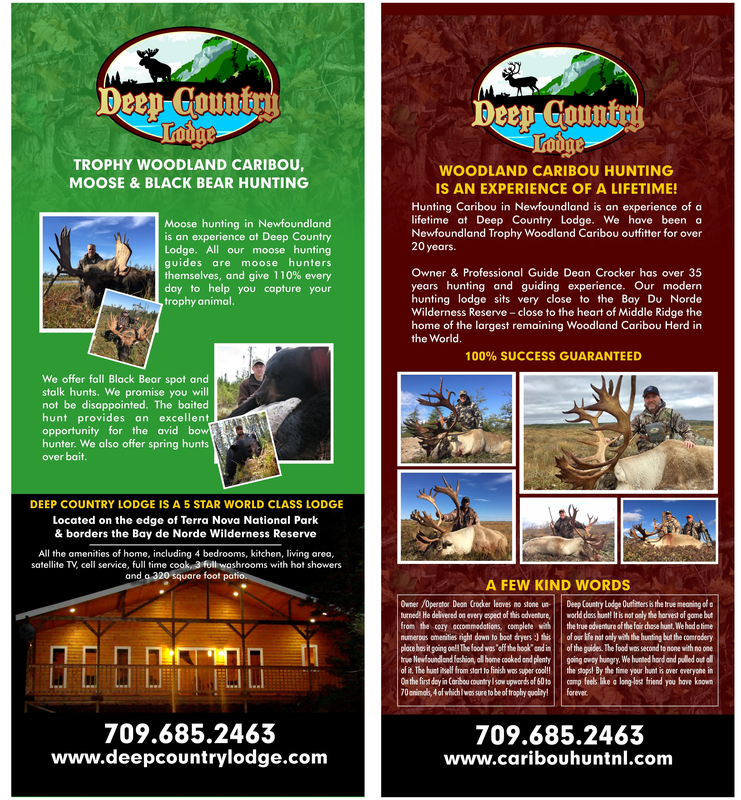 We were happy to provide them with a full color – double sided rack card for their needs. Are you a small business that doesn’t have a website yet due to the cost associated with having one professionally designed? NOW IS THE TIME! 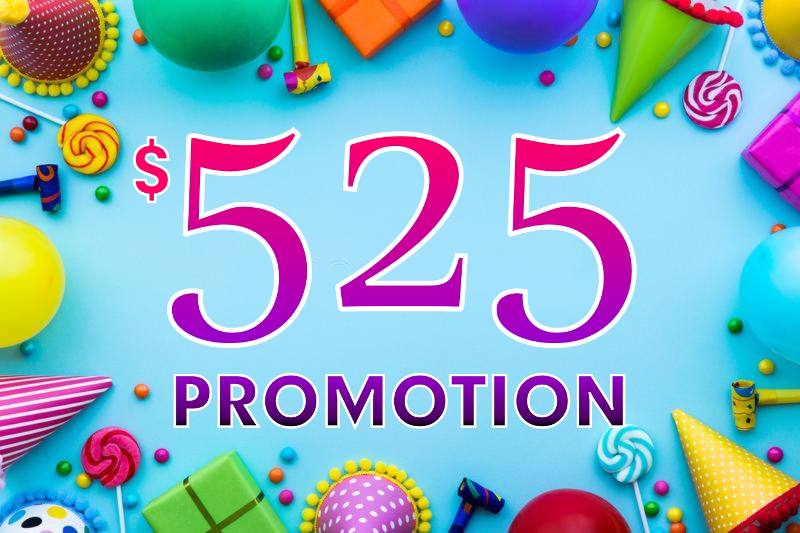 Silverhawk Promotions Ltd. currently has a promotion ongoing specifically designed to help the small business owner get a strong web presence with a professionally designed website at a discounted price. Now is the opportunity to have an eye catching website that is easy to navigate and is mobile friendly! All on the world’s most popular content management platform! Email us today for more information at kim@silverhawkpromotions.com! 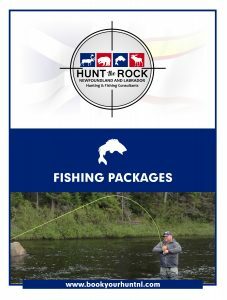 Looking for an affordable alternative to hotels and traditional accommodations in the Clarenville area? 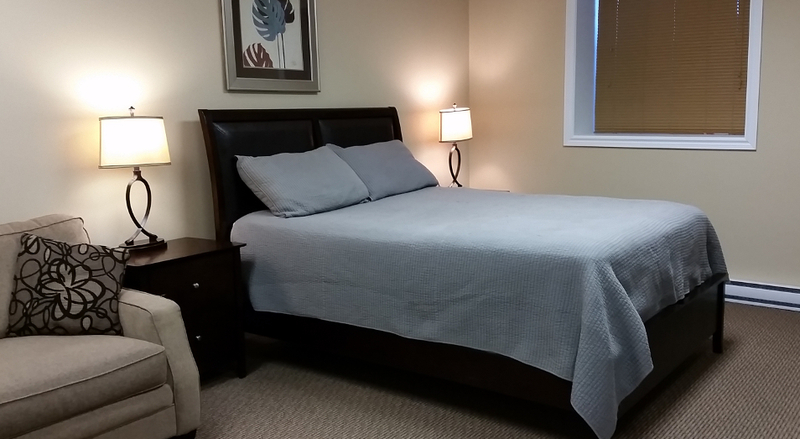 Clarenville Rooms & Accommodations is the perfect solution for those looking for something different. Beautiful Riverview Suites, located alongside the Lower Shoal Harbour River, boasts beautiful sunset views and 10 spacious suites in a quiet building. Each spacious suite includes a comfortable queen bed, mini fridge, flat screen TV, lounge area, and a private bathroom with stand up shower. Some suites even include work area with desk. 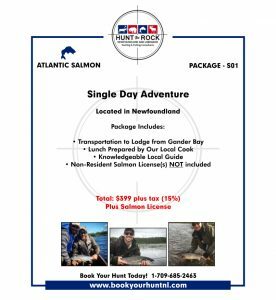 A short drive away is Stanley House, located in the heart of Clarenville offers partial ocean views and 10 spacious rooms in a quiet building. Each room includes a double bed, mini fridge, flat screen tv and private bathroom with stand up shower. Both properties include free WIFI , free parking and have common area kitchens for guests to prepare their own meals if they choose to do so, as well as a propane bbq for use. And the best part of all in these alternative accommodation options is the price! Riverview Suites starts at $100/night and Stanley House starts at only $75/night! Both properties offer discounted weekly and monthly rates. So why stay in a small cramped over-priced hotel room when you can stay in a spacious suite, have the ability to prepare your own meals for your family or group and do it all with more money in your pocket! 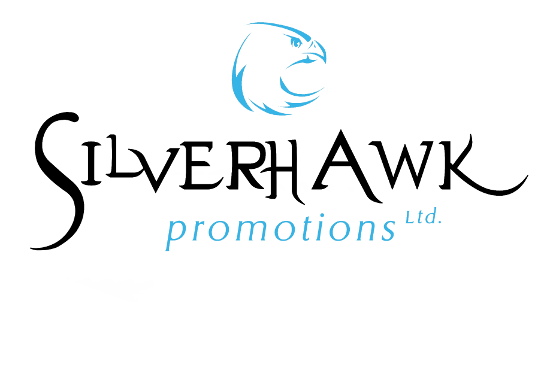 Silverhawk Promotions Ltd. is a strategic marketing and web development company targeting Clarenville, St. John’s, Newfoundland and surrounding areas. We offer web development, print and social media marketing solutions to a wide range of businesses, not-for-profits organizations and community based groups. With our combined professional experience of over 18 years in the web development & graphic design field, Silverhawk Promotions offers personal service and only the highest quality results. Need professional advice? Have a project you need assistance with or simply want to touch base? We'd love to hear from you. © 2018 - Silverhawk Promotions Ltd. All rights reserved.